Read the passage and answer the questions given below. The Airedale’s name was Muggs, and he was, as I have said, the worst of all my dogs. A big, burly, choleric dog, he always acted as if he thought I wasn’t one of the family. There was a slight advantage in being one of the family, for he didn’t bite the family as often as he bit strangers. One morning when Muggs bit me slightly, more or less in passing, I reached down and grabbed his short stumpy tail and hoisted him into the air. It was a foolhardy thing to do. As long as I held the dog off the floor by his tail, he couldn’t get at me, but he twisted and jerked so, snarling all the time, that I realized I couldn’t hold him that way for long. I carried him to the kitchen and flung him on to the floor and shut the door on him just as he crashed against it. But I forgot about the backstairs. Muggs went up the backstairs and down the front stairs and had me cornered in the living room. I managed to get up on the mantelpiece above the fireplace, but it gave way and came down with a tremendous crash, throwing a large marble clock, several vases and myself heavily to the floor. Muggs was so alarmed by the racket that when I picked myself up he had disappeared. In his last years Muggs used to spend practically all of his time outdoors. He didn’t like to stay in the house for some reason or other – perhaps it held too many unpleasant memories for him. Anyway, it was hard to get him to come in, and as a result the garbage man, the iceman and the laundryman wouldn’t come near the house. We had to haul the garbage down the corner, take the laundry out and bring it back, and meet the iceman a block from home. After this had gone on for some time we hit on an ingenious arrangement for getting the dog into the house so that we could lock him up while the gas-meter was read, and so on. Muggs was afraid of only one thing, an electrical storm. Thunder and lightning frightened him out of his senses. He would rush into the house and hide under a bed or in a clothes closet. So we fixed up a thunder machine out of a long narrow piece of sheet iron with a wooden handle on one end. Mother would shake this vigorously when he wanted to get Muggs into the house. It made an excellent imitation of thunder, but I suppose it was the most roundabout system for running a household that was ever devised. It took a lot out of mother. A few months before Muggs died, he got to ‘seeing things’. He would rise slowly from the floor, growling low and stalk stiff-legged and menacing toward nothing at all. Sometimes the Thing would be just a little to the right or left of a visitor. Once a salesman got hysterics. Muggs came wandering into the room. His eyes were fixed on a spot just to the left of the salesman, who stood it until Muggs was just three paces from him. Then he shouted. Muggs wavered on past him into the hallway, grumbling to himself, but the salesman went on shouting. Mother had to throw a saucepan of cold water on him before he stopped. That was the way she used to stop us boys when we got into fights. Muggs died suddenly one night. We buried him beside a lonely road with a smooth board above his grave. 1. What does choleric mean? 2. What was the advantage in being one of the family? a)	Muggs didn’t bite the family as often as he bit strangers. b)	Muggs didn’t bite the family at all. c)	Muggs was very fond of the family. 3. What was a foolhardy thing to do? 5. What did the narrator do when Muggs bit him slightly? 6. What does the narrator means when he says Muggs got to ‘seeing things’? 7. What does ingenious mean? 8. Which of the following four words is closest in meaning to the word ‘roundabout’? 10. How did the mother used to stop the children when they got into fights? 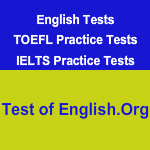 How to score well in the TOEFL Listening Test?